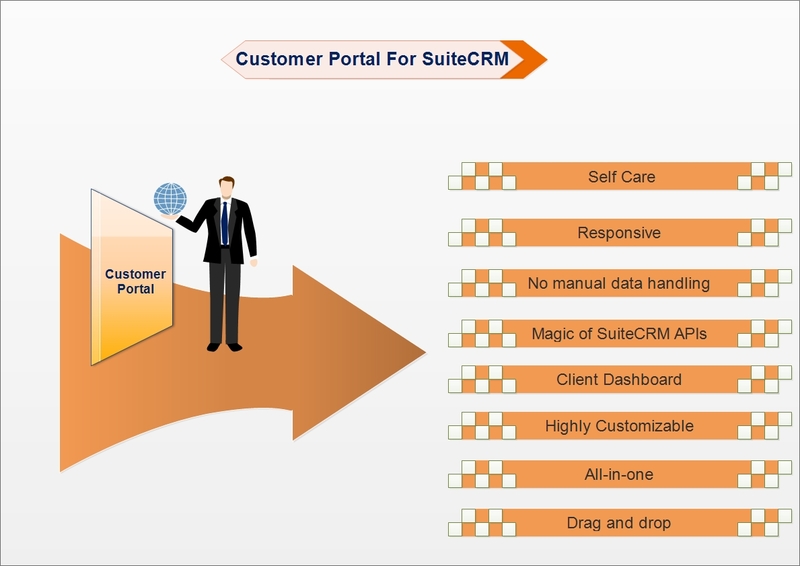 Customer Portal Customised by Fynsis for Suite CRM is a self-administrative client entrance arrangement that uses a PHP based front-end structure and Suite CRM as the backend framework fueling the entry and every one of its information. Client Portal enables you to give customers much altered, a smart organization on the Web. Self Service Customer Portal empowers associations to give self-advantage capacities to customers for help works out. This new value engages the customer to log and manage support cases, bugs on the web, lead age and empowers customers to direct participation in association correspondences in an automated way. All information from the Customer Self-Service Portal is normally invigorated inside SuiteCRM, murdering redundant or manual information dealing with. Customer Portal empowers you to give clients much customized, intelligent administration on the Web. Clients will now have the ability to get answers to their inquiries, finish exchanges, submit support issues and inquiry your insight base. With an open line of correspondence and a scope of self-benefit alternatives, you'll help consumer loyalty and in addition long-haul services. The Web and Mobile perfect, very adaptable client gateway for SuiteCRM. Our approach for a Responsive SuiteCRM Web Portal is a coordinated, versatile gateway arrangement, which causes you and your organization to ascend to the following level in your client relations. The client gateway is currently empowered with Bootstrap 3, with most recent highlights, as Bootstrap 3 is a matter of course empowered with versatile first and responsive. The system enables organizations to give self-benefit abilities to clients for help exercises. This new usefulness empowers the client to log and oversee support cases, bugs on the web, enables clients to oversee memberships to organization correspondences in a mechanized manner. All data from the Customer Self-Service Portal is naturally refreshed inside SuiteCRM, killing repetitive or manual data handling. The Customer Portal is conveyed by means of an installable bit of API programming that goes on each call and action between client confronting Web locales and an organization's SuiteCRM execution. Data transmitted through the Customer Self-Service Portal is fully API dependent and verified with authorized entry to SuiteCRM via API protocols. As entrance clients, your clients will get a devoted dashboard and can access and refresh every single module and its applicable records, contacts, gatherings, calls, cases, and so on directly connected to your organization SuiteCRM framework. We are here to guarantee that you are effective. In the event that you have exceptional needs, for example, requiring support for extra modules (counting custom modules) please get in touch with us and we will be cheerful to help you. SuiteCRM Admin can enable - Default modules or Custom modules from admin page and furthermore Customise & Quick Search Customer Portal. An all-around composed Customer portal is a client's home for data on their help demands. Clients can seek through past collaborations on to discover answers to questions that they've just asked, sparing them time—and sparing your group from redundant inquiries. Select modules from the hidden columns and request admin to able you to drag the modules from the disabled Column. List View Fields that need to show in Customer Portal and Select Detail View Fields for each module that needs to show in Customer Portal.